The cutest (and easiest!) 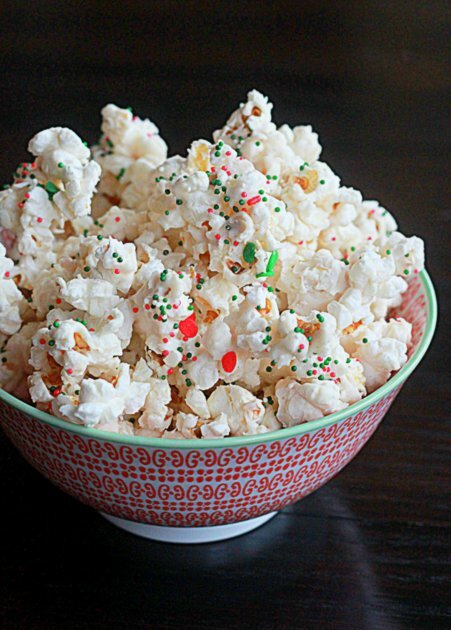 Christmas party snack ever, with slightly salted popcorn covered in candy coating and topped with cheery sprinkles. It feels wrong to write about something as frivolous as food, but I’m forcing myself to do so. I hope that it doesn’t come across as callous or uncaring … I’m far from either of those things when it comes to last week’s horrific events. I’m also pretty sure you’re not here to read about that. So: today I’m talking about popcorn. Christmas party popcorn, to be exact. 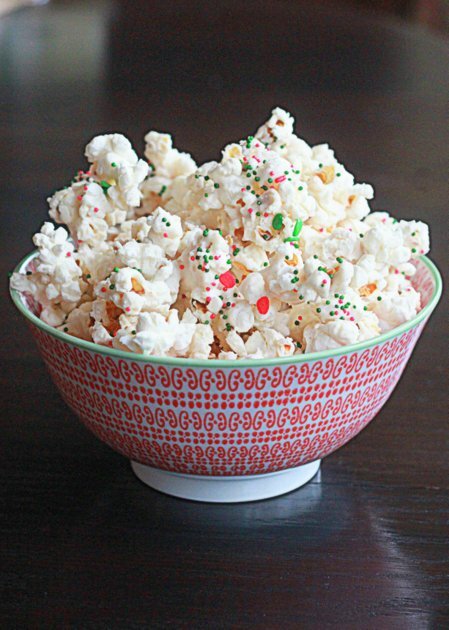 When I first saw party popcorn from the wonderful blogger Amy of She Wears Many Hats, I thought it was a revelation. For one, it’s pretty much the cutest party snack ever, with those adorable, cheery sprinkles. And slightly salty popcorn with candy or chocolate coating? Yes, I think I will. And then I made a batch and was blown away by how stinkin’ easy it was. Seriously, this stuff takes hardly any work. Then my guy tried it and moaned a little and cursed me for bringing crack into our home. So, yeah, we’re sold on party popcorn. 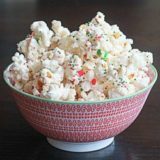 This version is made with eggnog-flavored candy melts and sprinkles in Christmas colors, but the beauty of this stuff is that the sky is the limit. Popcorn, candy melts or white chocolate, sprinkles and bam. Adorable party food. Add popcorn to a large bowl. Place candy melts or white chocolate in a medium microwave-safe bowl. Microwave at 50% power in 15-second increments, stirring every 15 seconds, just until melted. It usually takes me about 1 minutes and a half with my microwave. Working quickly, pour melted candy melts or white chocolate over the popcorn and gently but quickly stir until the popcorn is coated. Top liberally with the sprinkles, stirring once or twice to help distribute the sprinkles. Spread on a parchment-paper-lined cookie sheet and allow to harden, about one hour. Break up and serve. Keeps up to three days at room temperature when kept in an airtight container. I don’t think I’ve ever seen eggnog flavored candy melts! Not only is this a great Christmas snack, but it would make an awesome gift too. And it’s so pretty! I will most definitely pardon it because I didn’t know eggnog candy melts existed either (and this is the first recipe I’ve made with candy melts at all)! You can find them at craft stores with baking sections. I’ve seen them at both Michael’s and Joann. White chocolate is terrific too. 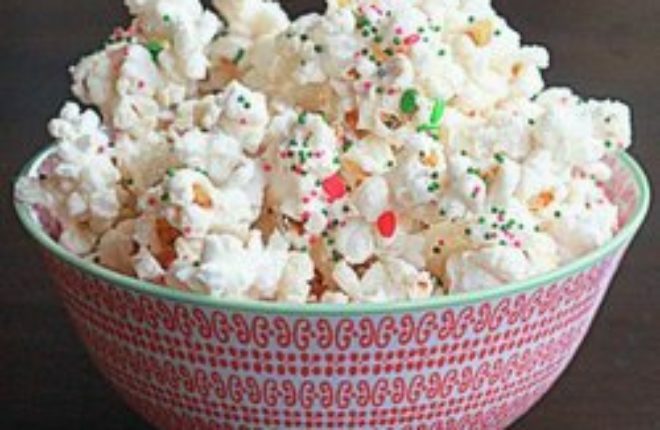 Christmas popcorn! never thought about it – but I love it!